I am long overdue in sharing this first RAK with you. 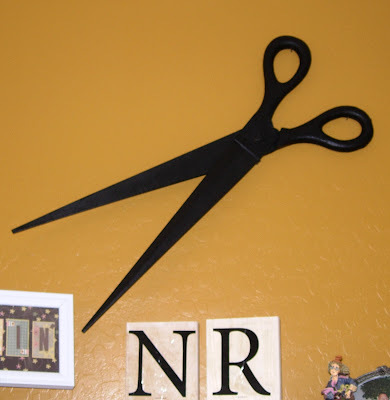 My dear friend and neighbor, Tammy Mendoza, gave me these decorative scissors to hang in my studio. They are HUGE ... approximately 30" long! I've hung them on the wall above my bookshelves that hold my stamp sets. They are by far my most favorite thing in my studio!!!! I don't know exactly where you can get these ... all I know is Tammy had someone pick them up for her at an older Cost Plus Imports store. This FABULOUS card is from my new friend and Stampin' Up! Downline, Mauna Kirkham. Mauna created this unique design using the Stampin' Up! Photo Corner Punch! I love the quilt pattern design she achieved with the punch! You can visit Mauna's blog, Ink~Paper~Scissors, HERE. I'll be away from blogging for a few days as I prepare for my upcoming stamp class ... SEE YOU NEXT WEEK !!! You have some fun new things going on over here at your blog. Great new cards and cool scissors. Ok those scissors are the coolest!!! Love them! Enjoy your prep time...I can't wait to see what you create for the girls afterwards ;) I know it will be FANTASTIC as always my friend! Those scissors are so cool! 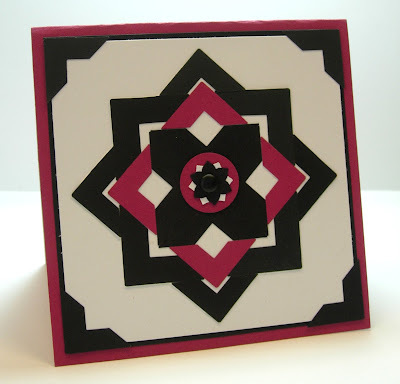 Love the creative use of the photo corner punch to make this quilt pattern card! These are such fantastic projects. I wish I was in your stamp club!!! !